We all know that the whole “Reduce, Reuse, Recycle” thing is in order of preference as far as caring for the earth goes. Which is why I am scouring Pinterest for home made house hold recipes. 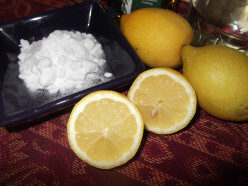 Using a lemon to clean the microwave has to have less impact than nasty chemicals and the plastic bottle it comes in. And I am sure I can buy bigger bottles of olive oil and honey than I can your average hair mask… and definitely less chemicals there. While I am dubious of the effectiveness of home made deodorant, its got to be worth a try right? So lovely human beans… do you have anything else I can add to my Pinterest board?